Every placenta that Airalia prepares and encapsulates is handled with the utmost love, respect, reverence, and care befitting this amazing, sacred, unique organ. Airalia was blessed to be able to apprentice as a midwife with Yayasan Bumi Sehat, a non-profit, village-based community health center in Nyuh Kuning Village near Ubud in Bali, Indonesia that provides over 9,000 health consultations for both children and adults per year and delivers over 550 babies per year. Airalia worked closely with the Balinese bidans (midwives) and worked directly with Bumi Sehat's founder, Ibu Robin Lim, CNN's 2011 Hero of the Year. ...in Bali, Indonesia, it is believed that the placenta, called Ari-ari, is the physical body of the child's guardian angel. While the physical body of the angel dies shortly after the baby is born, the angel's spirit stays with the child for his or her entire life. 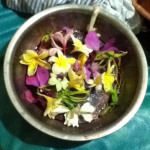 Airalia was deeply impacted by how each placenta was treated with such complete love and respect by the Balinese midwives. Fresh flowers were gathered and then used to cover each and every placenta. The placenta was carefully wrapped and given to the parents to take home and bury in a place of honor fit for their child's 'guardian angel'. In cultures all around the world and all throughout history, the placenta has been steeped in cultural beliefs, myths, and rituals. Elaborate ceremonies are performed involving the treatment of the placenta, its burial, or preparation for consumption. This incredible organ is the bridge between mother and child. It houses and protects the child throughout the pregnancy. It is no wonder that cultures throughout time have looked upon the placenta with such a sense of awe and reverence. Airalia uses her training in nursing to ensure aseptic technique during the preparation of each placenta in order to prevent any possibility of cross-contamination by possible blood-borne pathogens. All equipment used in the preparation of each placenta is thoroughly cleaned and sterilized between placentas. In preparing placentas for human consumption, Airalia has taken training to obtain her San Diego County food handlers card and certification.